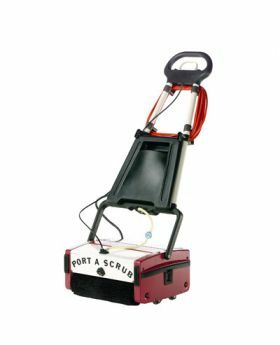 The Minuteman Port A Scrub 12 is a compact and versatile cleaning floor scrubber. The P12 scrubber excels on virtually any type of hard floor including vinyl, tile, hardwood, concrete, short nap carpeting, rubber floors and even escalators. Minuteman's P12 features a 12" cleaning path that can be used in congested areas and where other scrubbers cannot reach.